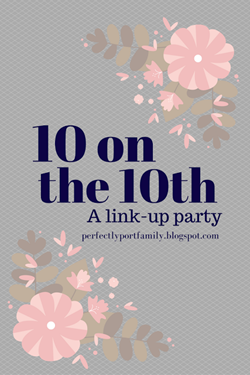 This month’s topic for 10 on the 10th with Perfectly Port is 10 Back To School Must Haves. So this took a bit of thought – are they back to school must haves for me or for my kids? So I decided to share a little of both. These new BIC Velocity Max mechanical pencils are my new favorites. They have a 75% wider eraser than the original BIC Velocity pencils and came with extra lead and erasers! I received these pencils for free to try! New notebooks. Sometimes I don’t want to buy new notebooks because the ones from prior years still have more blank pages in them than pages that were written on! But they’re only 25 cents at Walmart, so I bought them. Fun school supplies. Must be colorful. Binders. Both Gabbie and Zachary need binders this year! Organizational materials. I blogged here about how I keep myself organized during the school year, but I was recently given this new Flat Harmony Weekly Whiteboard Planner and I decided to use it to track what my kids want to take for lunch each day. It could have been used to keep track of weekly activities and appointments, but for now, this is what I decided to do with it! Planners. I have mine, Gabbie got her own, and Zachary uses the one that school provides for keeping track of his homework assignments! A sense of calm. Every year at the beginning of school I feel overwhelmed with everything starting. I worry about my kids and how they will do with their new classes. It helps to remember that every year I worry and every year things are ok.
Good summer memories. I definitely think we had a great summer and therefore the kids (and I!) should be ready to go back next week! Back to school celebrations. This gets the kids excited for the new year! Our school has an ice cream social the night before drop-in day, which is when we bring our supplies to school. Drop-in day is the day before the first day. A way to remember the first day each year. We take photos with our chalkboard! I’ll be posting this year’s after we go back! What are your back to school must haves?